Scrabble challenge; brain teaser; reconstructing a Scrabble game. If you've visited any of my Scrabble pages you know by now that I can't abide an invalid word on a Scrabble board, whether an intentional bluff or honest misspelling. In May 2008 I had reason to examine the plurals we had played in the Dover Scrabble Club (Delaware) over the previous year. I was curious about how many plurals we had played that would be disallowed by the electronic version of the American Heritage Dictionary Fourth Edition, which we now use, and which makes a determination of which plurals are not seen in common usage. We're talking plurals of indiscrete and amorphous thingies like IRES, CHINAS, PEACES, OATMEALS, etc., all of which the Official Scrabble Players Dictionary accepts without batting an eye. While simply searching for words ending in -S, I came across SHODS, much to my shock and dismay. Ok, so I wasn't really shocked and dismayed. It's not like the fate of the universe hangs on the perfection of one Scrabble game. You might say I was rather bemused that such an obviously bum word got through all my defenses and entered the record books undetected. On very rare occasions, a player sneaks a fake word onto the board, but it always gets caught during post-game processing. In fact, even after the game is over, the points for the bad play are deducted from the malefactor's score. Tough love . . .
SHODS and TRODS are two words which seem to have a nice sort of ring to a lot of people. I've seen TRODS used in books and newspapers, even. But with a moment's thought you can see how impossible they are. So the question was, who perpetrated this outrage of SHODS on a Dover Scrabble Club board? Well, I had a strong suspicion, but, me being me, I had to pull out the records and reconstruct the game play by play to actually prove it. Armed with the score sheet and a record of the finished game board, I figured that would be very easy to do. In fact, it had me pulling my hair out. In attempting to reconcile the score sheet and game board, I found myself thinking again and again that I must have miscalculated scores for various plays. And here I thought I was pretty good at adding up Scrabble scores . . .
Identify the villain who played SHODS! What's in it for you? I will add your name to the list of winners at the bottom of this page. They're really smart people! You may or may not need to know that all of the words played are found in the American Heritage dictionary. You will notice that the tile distribution deviates from the standard 100-tile set. For instance, this game had 13A 18E 3Y 2Q and no X or Z. That's because, for every game we scooped about 100 tiles from a mixture of three standard sets. (When Scrabble For Word Lovers was perfected, a much more natural mix of 300 tiles was implemented.) Every game is fresh and different. And here's the score sheet. I've put a lot of space in so, if you print it out, you can write the word or words right next to the score. I suppose the three 17-point plays in round 10 are interchangeable, although a real Sherlock Holmes might find evidence linking each one to a particular player. Don't look at me. The final adjustment to the scores for the leftover tiles is ignored here; it didn't change any positions. Sorry about the game itself being rather ordinary. Of course, all conventional Scrabble games look hopelessly drab once you've tried any of the Scrabble For Word Lovers games! Was this puzzle any fun for anybody? If it becomes a popular form of brain teaser for Scrabble folk, remember -- you saw it here first! I revisited this page in Sep 2016 to include links to the Scrabble For Word Lovers suite (see top of page.) I figured that, at the same time I might as well go modern, and whip up an image of the board. There's no describing the pain it gave me to reconstruct this game which predates Scrabble II For Word Lovers and its 8-tile rack, extended board, and stepped bonuses for big plays. 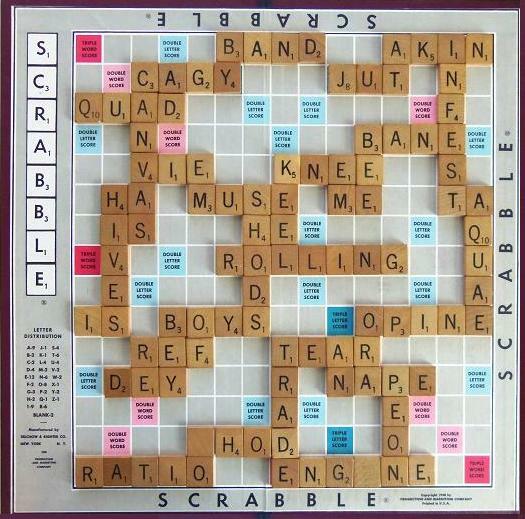 (In fact, this game only predates Scrabble II in the Dover Scrabble Club by a week or two.) At this stage of my life, it's almost impossible to believe that I ever derived pleasure from fitting 3- and 4-letter words together on a Scrabble board. I have to avert my glance from that BOYS/REF/DEY stairstep sequence for fear of doing bad things to myself. But I have to remind myself that long before Scrabble II was developed, our Scrabble, with its 3-letter minimum, refined list of 2-letter words, and respected dictionary, far outclassed "regular" Scrabble as played by the masses and the experts. Even though what you see here was a very mediocre game, with no bingos, for instance, the average word length (3.64 letters per word) is about identical to that in the 5-game playoff at the 2015 North American Scrabble Championship. If that claim piques your curiosity, please take a look at my Scrabble O intro page.